German thrash metal veterans KREATOR will unveil their new video for the title track of their forthcoming album, "Hordes Of Chaos", in about two weeks. The clip was shot on November 2 in Berlin, Germany with director Jörn Heitmann (RAMMSTEIN), who has also worked on the band's video for the song "Enemy Of God". Commented KREATOR guitarist/vocalist Mille Petrozza: "There will be two versions of the clip, one screening version and another one that will hopefully set new standarts in violent video art!! Be prepared!" 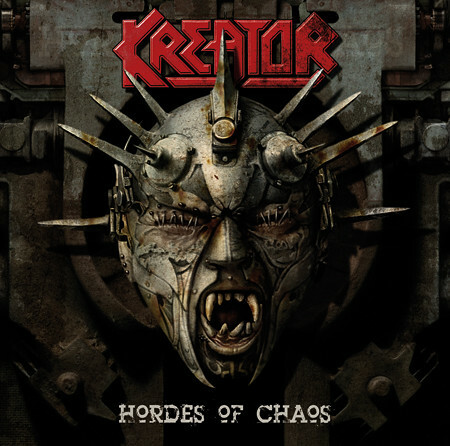 KREATOR will release "Hordes Of Chaos" in Europe on January 19, 2009 via SPV Records (except in Germany, where it will be issued on January 16). The CD will arrive in the U.S. on January 13. The new album will be available in three different versions. The jewel case edition includes the ten regular album songs, and the deluxe version features an additional bonus DVD with an atmospheric making-of in super-8 quality courtesy of a Berlin filmmaker. As a third option, the ultra-deluxe version comes with a t-shirt, a worthwhile photo book and an extended version of the bonus DVD, as well as the CD. The "Hordes Of Chaos" artwork was created once again by Joachim Luetke. Luetke designed the artwork for KREATOR's last album, "Enemy Of God", as well as past releases from bands like DIMMU BORGIR, ARCH ENEMY and RAGE. A teaser for the CD can be viewed below. 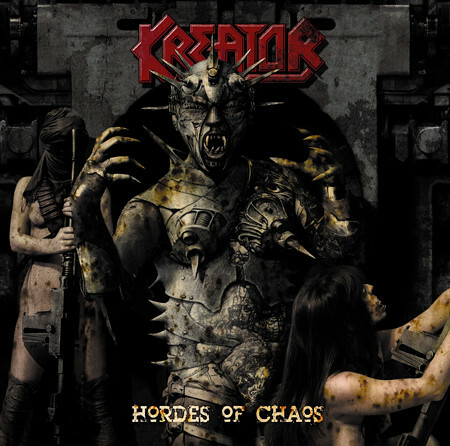 According to a press release, "Hordes Of Chaos" is "a powerhouse featuring rigorous thrash attacks and KREATOR's familiarly intelligent lyrics about self-determination and the dangers of contemporary war propaganda." "Hordes Of Chaos" was recorded at Berlin's Tritonus studios under the direction of producer Moses Schneider. Schneider is renowned for his fresh and exceptionally dynamic working methods with bands and artists such as BEATSTEAKS and TOCOTRONIC. "We consciously decided on Moses as our producer for the live recording of the basic tracks at the studio," band mastermind Mille Petrozza explains. "This was the first time since 'Pleasure To Kill' that we worked in this way. The new album is a 100% realistic reflection of KREATOR's live qualities. Instead of exploring every little detail to sterile perfection with the help of computer technology, this time around we wanted to deliver as dynamic a production as possible. There can be no doubt that we've achieved our target in 'Hordes Of Chaos'." The album was mixed in London by Colin Richardson (SLIPKNOT, BULLET FOR MY VALENTINE, CRADLE OF FILTH). KREATOR — Mille Petrozza (guitar, vocals), drummer Jürgen "Ventor" Reil, bassist Christian Giesler and guitarist Sami Yli-Sirniö — will embark on taheir two-month European tour in January alongside CALIBAN and ELUVEITE.